Immediate Delivery of Allard Chassis! In the past we've highlighted a few "mystery cars" that were built on Allard chassis, but they featured a bespoke body on the rear. 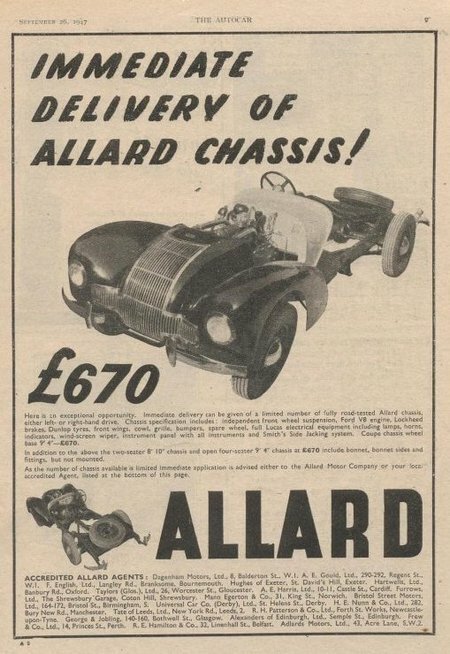 We knew very little about these cars until we came across this Allard advertisement the other day. It describes exactly what you received when your ordered your Allard chassis. “Here is an exceptional opportunity. Immediate delivery can be given of a limited number of fully road tested Allard chassis, either left- or right-hand drive. Chassis specification includes: independent front wheel suspension, Ford V8 engine, Lockheed brakes, Dunlop tyres, front wings, cowl, grille, bumpers, spare wheel, full Lucas electrical equipment including lamps, horns, indicators, wind-screen wiper, instrument panel with all instruments and smith’s Side Jacking system. Coupe chassis wheel base 9’ 4” -£670. In addition to the above two-seater 8’10” chassis and open four-seater 9’4” chassis at £670 include bonnet, bonnet sides and fittings, not mounted.